Troops build underground shelters along Kashmir frontier after soldiers come increasingly under fire. India has started constructing underground bunkers along its frontier with Pakistan in Kashmir amid fears the nuclear-armed rivals are preparing for a major escalation in conflict. The fortification work follows an attack on India's Uri army base on Sept 18, which killed 19 soldiers and provoked huge public anger in India. New Delhi blamed the attack on Pakistan-backed militants and responded by launching "surgical strikes" across the border into the part of Kashmir controlled by Pakistan last Thursday. A visit by The Daily Telegraph to a military checkpoint near Uri in Indian-controlled Kashmir revealed the army has quietly but decisively bolstered its fortifications along the "Line of Control". Troops from the 116th Infantry Brigade said exchanges of fire at night have grown since the Uri attack. "They shoot every time they see us," said the soldiers, who asked not to be named. "They shoot on sight. If we see movement, we shoot." The men, who previously slept in flimsy canvas tents, have built a series of stone-and-cement-walled bunkers, measuring about six by ten feet. The bunkers provide essential cover, especially at points along the border where - due to the contours of the Himalayan valley - "no man's land" is reduced to a thin slither. Residents in a village near Uri, which lies outside India's border fence but remains on the Indian side of the Line of Control, said the road leading to their homes had only two or three bunkers before the Uri attack took place, but now has as many as 50, many of which extend underground. Given the scale of construction along the single stretch of road, it is likely India has constructed hundreds of such bunkers during the past fortnight. The move comes amid increasingly war-like rhetoric between the two nuclear-armed rivals. Last week, Khawaja Muhammad Asif, Pakistan's defence minister, warned that its tactical nuclear weapons were "not just showpieces". "If our safety is threatened, we will annihilate them," he said of India. Ram Madhav, a senior leader of Indian prime minister Narendra Modi's BJP party, said India would no longer take "a tooth for a tooth" to avenge Pakistani aggression. "For one tooth, the complete jaw. Days of so-called strategic restraint are over," he said. 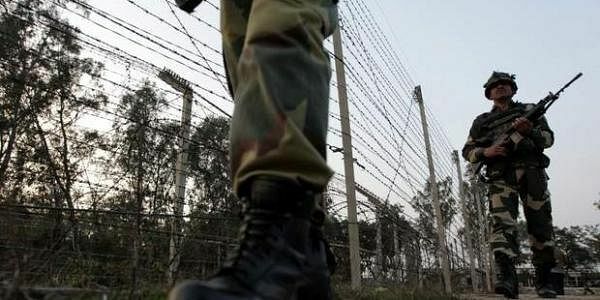 On Tuesday, KK Sharma, head of India's border security force, told reporters: "We are having active engagement at the Line of Control and we are receiving shelling from the other side." Rudra Chadhuri, a South Asia war studies expert at King's College London, said: "Creating these bunkers is a sensible thing for the military to do. "They don't want to be caught unaware or by surprise, if there is an attack from the other side and they're not able to defend key positions." Meanwhile, village elders in other settlements along the Line of Control warned that a resumption of fighting between India and Pakistan - which last fought a localised conflict in Kargil in 1999, but agreed a ceasefire in Kashmir in 2003 - would inflict horrendous damage on their homes, and leave them with no escape route. "People will die here," said 80-year-old Haji Abdulla Lone, chairman of Uri town's market traders. "If war starts, the army will give us no shelter. We will have nothing to eat." Others in the town urged the international community to intervene before recent skirmishes were allowed to escalate into conflict. "India and Pakistan must talk. The West can do a big role. You can pressure both countries to solve the Kashmir issue," said shopkeeper Khurshid Hando, 45. "Everything can be solved."